This artist's impression shows a red giant engulfing a Jupiter-like planet as it expands. A swollen star near the end if its life has been caught devouring one of its own planets — a scenario that could one day be replayed on Earth when our own sun dies in billions of years, scientists say. Astronomers discovered the cosmic crime scene while studying an ancient star that has expanded in its old age to became a so-called "red giant." The star, called BD+48 740, is older than our sun and much bigger. Its radius is 11 times larger than that of our sun. 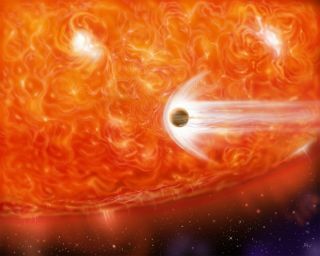 As the star swelled into a red giant, it likely absorbed its innermost planet, researchers said. Two key pieces of evidence identified the star as a planet-killer, researchers said. First, the astronomers found abnormally high amounts of lithium, a rare element in the universe, inside the star. That fact alone hinted that a missing planet may be involved. "In the case of BD+48 740, it is probable that the lithium production was triggered by a mass the size of a planet that spiraled into the star and heated it up while the star was digesting it," said Wolszczan, who led the team that discovered the first planets beyond our solar system, back in 1992. Then there was the strange orbit of a giant planet discovered around the star. The huge planet is about 1.6 times as massive as Jupiter and circles the star in an extremely elliptical orbit. "We discovered that this planet revolves around the star in an orbit that is only slightly wider than that of Mars at its narrowest point, but is much more extended at its farthest point," said study team member Andrzej Niedzielski of Nicolaus Copernicus University in Torun, Poland. "Such orbits are uncommon in planetary systems around evolved stars and, in fact, the BD+48 740 planet's orbit is the most elliptical one detected so far." The gravitational fallout of a second planet plunging into the parent star could have been enough to toss the observed alien planet into the chaotic orbit seen by the researchers. "The highly elongated orbit of the massive planet we discovered around this lithium-polluted red-giant star is exactly the kind of evidence that would point to the star's recent destruction of its now-missing planet," said study team member Eva Villaver of the Universidad Autonoma de Madrid in Spain. Still, Villaver said catching such an event in the act was an "improbable feat." The international team of astronomers used the Hobby-Eberly Telescope at the McDonald Observatory in Texas to study the star BD+48 740. The study's lead author is astronomer Monika Adamow of Nicolaus Copernicus University. Astronomer Grzegorz Nowak, also of Nicolaus Copernicus University, also participated in the study. The research into the case of the planet-killing star is detailed in a study appearing online in the Astrophysical Journal. You can SPACE.com on Twitter @Spacedotcom. We're also on Facebook & Google+.